The Mosaic is a favorite in busy production and on-air studios because of its modular design and sleek profile. With a classic style and rugged construction that will shine through years of round-the-clock operation, the modular, flexible Mosaic by Logitek is ready for any radio or TV application. An advanced control surface for our digital Audio Engine TDM router or our JetStream AoIP system, the Mosaic comprises a series of modules that give you the precise number of faders and controls for your needs. Fader modules, monitor modules and softkey modules each contain versatile controls along with full color LCD screens. The Mosaic Fader Module features two Penny & Giles faders and illuminated On/Off-Start/Stop buttons for each fader. Color of the button lighting can be changed by the user. There are dedicated controls for six bus assignments, default input selection and talkback insertion. Two rotary controls accomplish input routing, input mode, input trim level, pan/balance level, Aux bus assignments, 4 band equalizer, and dynamics processor adjustment. The color LCD display provides control screens for these functions along with input level metering and a 16 character input source name. 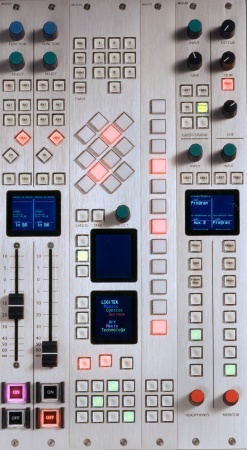 The dual fader module occupies two slot positions in the control surface frame. This module occupies two slot positions in the frame. It provides controls for the Main Monitor, eadphones, Guest Headphones, and Talkback level. The Monitor and local Headphone controls also have five input select buttons. The Guest and local headphones can be configured to follow the input selection of the Monitor control. All three controls provide input selection control from the router with the source names up to 16 characters displayed on a color LCD. The Wide-Softkey Module occupies two slot positions in the Mosaic frame and provides a total of 36 programmable, illuminated buttons. Fifteen of the buttons are lighted red and 21 are yellow. The lighting can be set to any of 16 brightness levels and a variety of functions can be assigned to the buttons by Logitek Command Builder triggers or Audio Engine Command Library routines. The module also provides timer controls. The two color LCD screens provide information on router, meter, clock, timer and profanity delay functions as well as user text set by system programming. The single slot-width Narrow-Softkey Module provides a total of 18 programmable and illuminated pushbuttons. Twelve buttons feature red lighting and six are yellow. Each of the button illuminations can be varied to one of 16 different brightness levels. A wide variety of functions can be assigned to the buttons and the lighting through Logitek Command Builder triggers or Engine Command Library routines. The Mosaic Wide Meter Bridge includes a 40 segment tri-color LED bargraph stereo meter providing simultaneous VU and peak indications. A 16 character LED display also shows the current meter audio source. Six full color LCD screens provide a wide variety of user programmed text and graphics (using Logitek Command Builder triggers) as well as system functions. System displays include clock, up/down timer, auxiliary bus meters, and talk delay operation parameters. The Mosaic Narrow Meter Bridge features a 40 segment tri-color LED bargraph stereo meter providing simultaneous VU and peak indications. A 16 character LED display also shows the current meter audio source. Also included are two LCD color screens that can be user programmed for a number of different functions. These include auxiliary bus meters, clock, up/down timer, and integrated talk delay operation parameters. User programmed text and graphics can also be displayed on the screens. For even greater flexibility and visibility of information, Logitek's vScreen virtual metering software can be added to bring multiple meters, router controls, timers and other graphics to any size PC screen. vScreen is user configurable with convenient drag-and-drop GUI for easy setup. Contains controls for main monitor, cue speaker, operator headphone, guest headphone and talkback level; Monitor and operator phones have 5 input select buttons; Guest and operator phones can be set to follow the monitor source selection; all three sections have direct access to the input router; the full color LCD screen displays the 16-character source names. Fader and Monitor modules are available in standard (USA) or U.K. configurations. Contains 15 programmable buttons with red backlighting; 21 programmable buttons with yellow backlighting; timer controls; two full color LCD screens that display router, meter, clock, timer, and profanity delay information as well as user text. Each Programmable button can be set to one of 16 brightness levels. Contains 12 programmable buttons with red illumination and 6 programmable buttons with yellow illumination; each button can be set to one of 16 brightness levels.